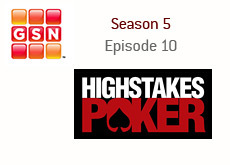 The tenth episode of the fifth season of "High Stakes Poker" aired on GSN last night. The lineup was the same as last week: Tom Dwan, Howard Lederer, Daniel Negreanu, Joe Hachem, Nick Cassavetes, Patrik Antonius, Phil Laak and Antonio Esfandiari. The blinds were $400/$800 with $200 antes. Joe Hachem won the first hand of the episode from Patrik Antonius. Hachem held 8-5 and bet on the turn with the board reading 10-8-4-Q. Antonius, who held bottom pair, elected to let go of his hand. Antonius then won a very small pot from Joe Hachem. The next hand involved Antonio Esfandiari and Patrik Antonius. Esfandiari limped with 9-9. Antonius raised to $4,800 holding the A-J of clubs, and Esfandiari called. The flop came A-6-10 with two clubs, giving Antonius a pair of aces and the nut flush draw. Antonio checked, Antonius bet $7,000 and Antonio called. The turn was the 5 of hearts. Antonio checked again, Antonius bet $19,000 and Esfandiari elected to make the call. The river was the Ace of spades, giving Antonius trip Aces. Antonio checked yet again, Antonius bet $41,000, and Esfandiari elected to fold. In the next hand, Nick Cassavetes tried to run a bluff on Tom Dwan. With the board reading A-3-Q-Q-A, Cassavetes bet $11,000 on the river after also making a bet on the turn. Cassavetes had complete air, while Dwan held A-10 for the full house. Dwan raised, and Cassavetes quickly let go of his hand. In the next hand, Dwan raised to $3,500 holding K-Q offsuit, and Negreanu elected to make the call with A-6. The flop came A-9-J with two clubs. Negreanu checked, Dwan bet $5,700, and Negreanu called. The turn brought the Queen of spades. Negreanu bet $11,000, and Dwan made the call. The river was the 10 of clubs. Negreanu checked, Dwan bet $28,800, and Negreanu elected to fold. In the next hand, Laak limped with the J-10 of hearts, Dwan raised to $4,000 with 8-8, and Laak made the call. The river came 6-9-6 with two hearts. Laak checked, Dwan bet $6,300, Laak raised to $21,300, and Dwan made the call. The turn brought the 6 of spades, giving Dwan a full house. Laak checked, and Dwan also checked after asking for a count of Laak's chips. The river was the 8 of hearts. Laak checked, Dwan bet $9,400 and Laak called after MUCH deliberation. Dwan showed the full house and took down the pot. In the next hand, Negreanu raised pre-flop holding K-J offsuit, Laak called with the 8-5 of spades, and Hachem called with 4-4. The flop came K-8-5, giving Negreanu a pair of Kings and Laak two pair. Hachem checked, Negreanu bet $6,500, Laak called and Hachem folded. The turn brought the nine of hearts. Negreanu checked, Laak bet $18,500, Negreanu raised to $43,500, and Laak made the call. The river was the 2 of hearts. Negreanu checked, Laak bet $54,200, and Negreanu folded, certain that Laak had a set of fives. In the next hand, Laak limped with K-Q offsuit. Lederer called with 6-6, Dwan raised to $5,400 with A-Q offsuit. Negreanu called with the A-8 of hearts. Laak and Lederer both elected to call as well. The flop came Q-A-2. Negreanu checked, Laak checked, Dwan bet $14,300, and everyone except Negreanu elected to fold. Negreanu made the call. The turn brought a 2 of hearts. Negreanu checked, Dwan bet $34,600, Negreanu raised to $84,600, and Dwan made the call. The river was the four of hearts. Both players checked and Dwan showed his top two pair for the $221k pot. In the last pot of the episode, Dwan raised to $3,000 with J-J. Esfandiari called with the Q-3 of hearts. Antonius raised to $14,400 with the 10-6 of spades. Dwan called, and Esfandiari elected to fold. The flop came A-8-2. Antonius bet $21,000, and Dwan called. The turn brought the King of spades. Antonius bet $52,000 with nothing but air, and Dwan finally decided to fold. There will be a new group of players on next week's episode. 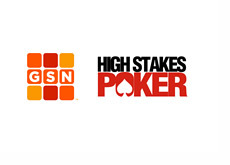 Some of the players include Tom Dwan, Dario Minieri, Phil Laak and Eli Elezra. The preview for next week's episode says that Dwan and Elezra will get involved in a couple of pots together, with Elezra getting the best of Dwan.